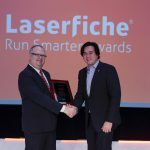 LONG BEACH, CA (Laserfiche)—March 12, 2012—Laserfiche (booth #3) today announced that it will provide attendees at the Gartner Portals, Content & Collaboration Summit (PCC) in Orlando, FL, with complimentary copies of new Gartner research featuring Collin County, TX. Titled “Document and Records Management Initiative Improves Customer Service and Efficiency,” the new Gartner report details key implementation considerations for success with content and records management. At PCC, attendees can also hear directly from Margaret Anderson, Records Manager for Collin County, who will deliver an educational presentation titled, “Roadmap for Enterprise Content Management Standardization” on Tuesday, March 13, at 9:45 am in Osceola A. During the presentation, she will provide an overview of Collin County’s multi-phased ECM implementation.